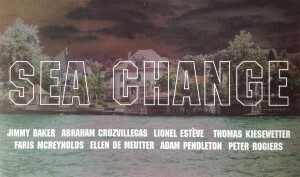 Roberts & Tilton is pleased to announce Sea Change, an exhibition of recent works by Jimmy Baker, Abraham Cruzvillegas, Lionel Estève, Thomas Kiesewetter, Faris McReynolds, Ellen de Meutter, Adam Pendleton and Peter Rogiers. This unique and prolific group of international artists reflects the broad tendencies of the international marketplace. Each artist contributes contemporary ideas of three-dimensionality in painting and sculpture, while new power and old ideas re-circulate. Sea Change highlights modernity as the agency of transition, but notes that while moving forward, perpetual historical elements continue to be incorporated into contemporary artwork. texturized and actively expressive nature of his large-scale oil paintings, McReynolds’ large-scale watercolors are delicate, painted with a careful sensitivity that focuses on inward contemplation, rather than outward physicality. Ellen de Meutter (Belgium) has re-categorized her own personal archive of images, shapes and colors to forge a new and fascinating utopia, where a car crash is on equal footing with boxers in a ring. Continuing his social commentary in the form of silk-screened canvases, Adam Pendleton (United States) focuses on throwaway tabloid culture, where celebrities are glorified, immortalized and mirrored. Pendleton has become an extension of what was started by Duchamp and continued with Warhol. Peter Rogiers’ (Belgium) interest in the figure and its many physical permutations redefines the characteristics of movement and space to create works that are both vivid and haunting, yet ultimately, sublime.